When parents want their kids to enroll in school they always seek a good one in both aspects; learning matters and ideal classroom atmospheres. They always search for a good school that has safe, comfortable and colorful classrooms to encourage their kids to study and learn more skills. The schools’ principles have a great burden to furnish their schools perfectly. In this article, I aim to help those principles getting ideas to have ideal and wonderful classrooms for little kids. The best approach to go for when furnishing your schools is to go ergonomic furniture. This furniture will ensure you keep the essential standards for classrooms. 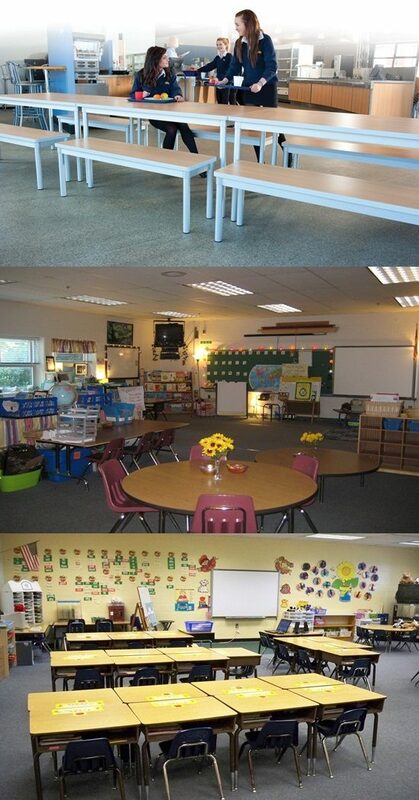 Let’s talk in details how to design your classrooms for little kids. First of all, you have to care of the classroom colors not overwhelming them with colors not to distract the kid attention. But try to balance between the colors to make the kids feel happy and energetic. Secondly, don’t forget to use educational funny elements as well like wallpapers that include alphabetic designs, animal or primary colors prints. These elements are useful when the kid get bored he/she can look at them and feel happy with keeping him/her gaining more skills and knowledge. Then, how to choose the basic furniture which includes chairs and tables. Above all, to maintain the kids’ safety, you have to choose durable and comfortable elements too. The chairs for kids’ classrooms are available with a variety of style, shapes, designs and materials. For the KGs, you may go for a combination of soft and hard plastic chairs which will not cause any harm for kids and remember to choose elements without any curves. While the tables need to be adjustable and also with rounded edges. There is a variety of tables’ sizes and shapes you have to choose them according to your classrooms sizes. The popular ones are round or rectangular tables while there are kidney-shaped tables which allow all the kids to view the board and the teacher equally. At last, don’t forget to decorate the classrooms with educational themed rugs and toys. Whatever you choose, keep in mind, the safety and coziness matters. Enhance your home with the amazing kitchen design called "Island kitchen"
Which bunk bed do you need? princess – twins..